The Theatre Phase - Each round a theatre card is drawn which gives the players a mini-objective for the round. This adds more to the game then simply trying to defeat each other. In some rounds, players will attempt to use kickback to remove their opponent from the inner region of the arena to gain greater favour, while in other rounds the player with the least or most armour (life) will simply gain favour. The Action Phase - The majority of the game is played in the Action Phase. During the Action phase, players draw five cards and take turns playing them in turn order. Cards will allow players to either move, attack, or gain favour/ armour or any combination. During the action phase, players will attempt to complete the mini-objective provided by the theatre cards, attack their opponents, gain favour for the favour (buying phase), or use the arena tokens to push their turn to the next level. The Favour Phase - in this phase players use favour gained during the action phase to buy cards or use the four common actions (first player, lobbying, etc.). The action cards bought during this phase are placed in the discard pile and can be drawn later in the game to create even better attacks, movement, or favour bolstering. We played this game multiple times and each time was fun, but, my favourite scenario was Junkyard Dogs. While the arena tiles didn't add too much to this particular scenario, we drew interesting Theatre Cards and the Characters we played made the game very tense and thematic. The arena erupted into thunderous cheering as we entered the arena from separate sides, it was a sport /game for them but it was life and death for us. I had never faced The Gaul before but I had heard rumours of the strength of his spear. As he began to circle I could feel the sweat dripping and the grip on my sword weaken, I gripped tighter and moved towards the shield. If I could distract him for another round I might be able to gain enough favour to get a better attack. He threw his Ranged Javelin, bringing me down to his armour level. The crowd cheered as the blood poured from my arm. I tried to stay calm I pulled the Ranged Javelin from my arm and placed it into my discard. A few rounds later I was still alive, but this time I was circling him. He moved back to gain shelter from my attack, but it was no use. Little did he know that his downfall would be the Ranged Javelin he had only recently thrown at me. Throwing it with all I had, I finally knocked him down to 0 armour, the crowd went wild and I was victorious, "For Carthage", I yelled over the cheers of the arena! That was a highlight of one of the games we played. 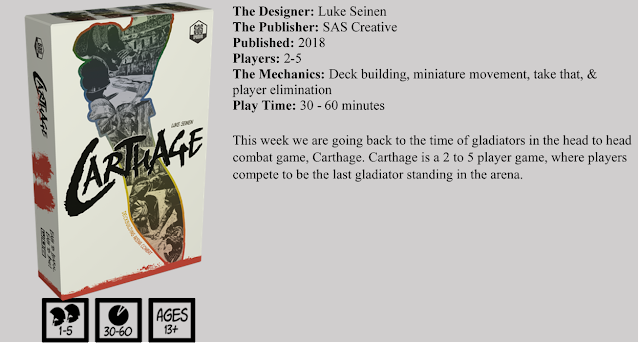 The gameplay in Carthage was quick and easy to learn with mechanics that fit the theme very well, making you invested in the game and on the edge of your seat when your armour was low. The suspense was very similar to Spartacus without all of the lying and betrayal, instead, players spend the entire game in the arena, collecting cards and playing awesome combos. While the gameplay was great, one thing that we weren't as big of fans of was the artwork. Some of the action cards were well laid out with clearly depicted images and sweet bright red blood splatter that reminds players of a Frank Miller graphic novel, however; other cards were not as clear and with the dark outline made the artwork even harder to identify. That said, the 6mm miniatures had some amazing detail and really added a layer to the game. While they were a little flimsy, even with this the game was still very enjoyable and will be played often. Carthage is a fun and interesting game, combining deck-building with gladiatorial combat in a way that leaves you wanting to play again. The game was easy to learn and quickly pulls you into the fight. If you enjoy combat games with a little more luck than skill this might be the game for you. The game has multiple modes and scenarios allowing you to play a pre-made game of player vs. player, team vs. team, or solo/co-op against an AI gladiator controlled by an app or lets you make your own scenarios. No matter how you choose to play, this game will keep you on your toes. While we weren't the biggest fans of the artwork, the gameplay more than makes up for it and has us coming back for more. Kickstarter originally and is now available for purchase via Amazon.